Overlooking one of the ponds at Bowers Rock State Park. It was time Friday for one of my occasional expeditions to Bowers Rock State Park, a big chunk of publicly owned land that now is getting renewed attention from the state parks department after decades of not much going on. Earlier Friday, I had the chance to meet with ranger Scott Youngblood and the state parks department’s newly appointed district manager for the Willamette Valley. She is Sarah Steele, who came from a similar job in Arizona and now lives in Albany. For years, access to the 568 acres of ponds, meadows, brush, and dense woods has been difficult because there’s no parking lot at the entrance. To visit the place, you have to park by the side of the road on Bryant Drive, then hike a quarter-mile on a road the property owners have posted as private even though, according to the state, the public has a right to use it too. Sarah Steele wants to move ahead to make the park live up to its mission of serving the public, with due concern for neighbors who worry that more access to the park will lead to more problems, including traffic and crime. I got the impression that she will get this done, albeit slowly, with diplomacy and tact. As an early step, Youngblood has installed bigger signs at the boundary between the park and private property. He’s also ready to post, at the entrance, a map emphasizing the need to stay clear of private property on the other side of the line. A major project is in the works to deepen a natural channel from the river to a big pond in the park and from the pond back to the river at a point downstream. The idea is to increase — when the river runs high — the number of days that water flows through this channel and the pond. A lot of permitting still has to take place, as I understand it, but the channel work is tentatively scheduled to start in 2019. Before then, the roadways will have to be beefed up for heavy equipment. As it is, the gravel or dirt road into the park quickly peters out. 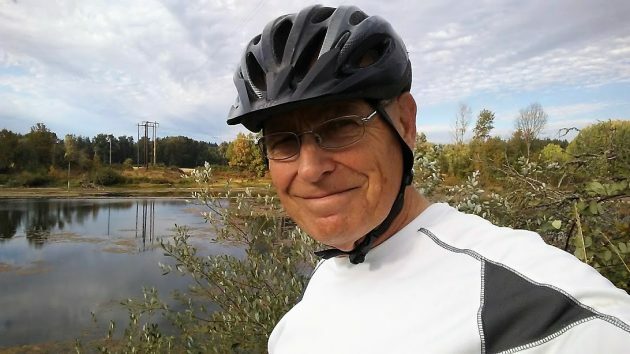 My bike and I threaded our way along the very edge of a huge cultivated field, under lease for agriculture, until we picked up, more or less by luck, a gravel track. The story has been edited to include the acreage of Bowers Rock. 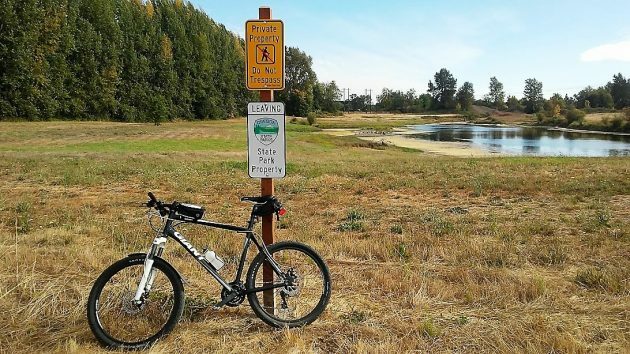 Instead of “several hundred acres,” it’s 568 acres, according to Willamette River Greenway Park Ranger Scott Youngblood. 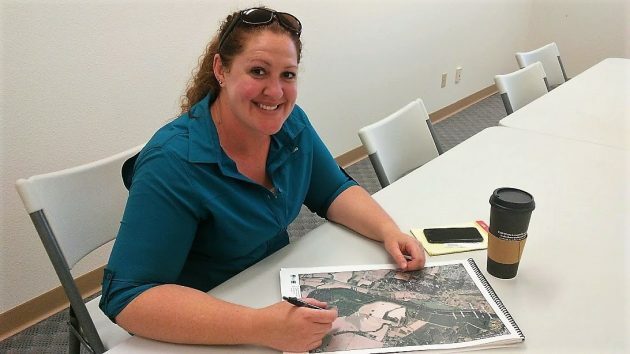 Sarah Steele is the state parks’ new district manager for the Willamette Valley. 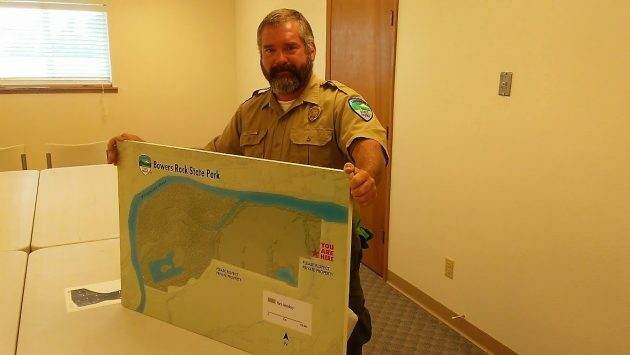 Ranger Scott Youngblood holds the new map he’ll post at the entrance to show the extent of Bowers Rock State Park. New signs make it clear where the park ends and private property starts. 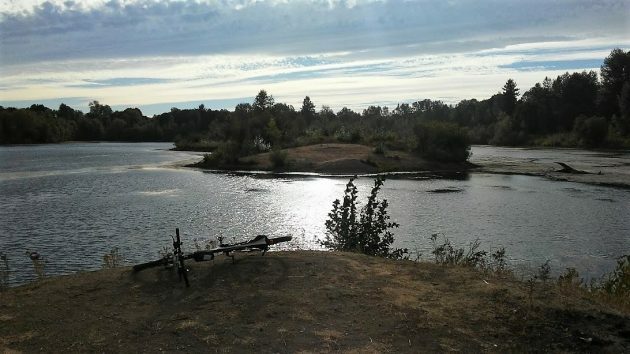 Biking into Bowers Rock: Gravel, water, sky, sunshine, and lots of trees. Glad to have this more accessible. I first stumbled across Bowers Rock in the late 70s. I found a seemingly misplaced post in the ground that said “State Park Boundary”. It was quite a surprise. It was several years after that when I first heard the name Bowers Rock state park. It’s sad and disappointing that all these years later nothing has been done. Less than a week after bigger signs were installed by OPRD delineating private property three people were discovered trespassing onto private property and 2 private property signs were vandalized. The problems never end. I’m wondering if you can actually get down to the river. I can’t really tell from this photo. So glad to hear they are moving forward with improving access. I live adjacent to a major access point for the Oak Creek Trail, and respect the private property owner’s concerns, but this is a State park that should be accessible for public enjoyment. We strive to be open and welcoming to people using the trail access near our home and have had NO problems. Would be nice if they can purchase the remaining pond. Then there wouldn’t be any confusion.